What is a Contact Link? 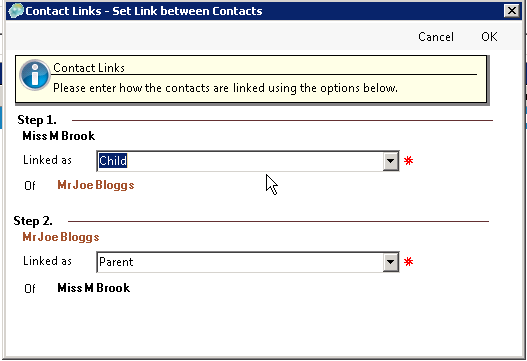 Contact link gives you the ability to link two or more contacts together. For example you might want to link an Individual Contact to an Organisation as an Employee\Employer Relationship. There are multiple options available i.e Spouse to Spouse, Benefactor to Beneficiary, Parent to Child etc. Contact links are obviously a good way to record relationships between parties, but MatterSphere goes one step further; In the creation of new matters, MatterSphere will prompt you that there is a linked contact and you will be able to automatically create them as an additional associate. So for example if you have created links between your Organisation Client and the employees of that Organisation, MatterSphere will ask when you create your next matter for that Organisation if you want to automatically create associate entries for one or more employees as well. Select the Contact you want to link to another contact. Add all the search details for the Individual or Organisation you wish to link to. Links can also be removed from contacts to enable quality records to be maintained.